If you were once in a lifetime in the Ukrainian Carpathians, then pay attention to the dark berry called blackberries. It can be found in the mountains. Outwardly, it resembles a raspberry, but is slightly larger and in color – mulberry. As for the taste, it is very unusual – sweet and sour. If you’ve never tried this berry, it needs to be fixed in the near future. In addition, the Blackberry is very useful because it contains a lot of vitamins and minerals. Berries are indispensable, if people want to saturate your body with vitamins and to prepare it for winter. As for the leaf, then use them to treat diseases of the heart and nervous system. Broth can gargle in sore throat. Very tasty tea is obtained from a mixture of leaves and fruits. Indispensable blackberries and diabetes. The berries can be made juice, which is useful in bronchitis, sore throat, diarrhea, and female diseases. If there are problems with the stomach, it is better to prefer juice instead of fruit. Some people do not carry a blackberry and have nausea and vomiting. Remember, the berries can cause allergies. Blackberries have an endless list of beneficial properties, vitamins and ingredients. Moreover, it is one of the safest berries and has no obvious contraindications to use. 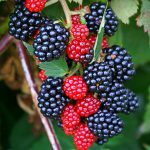 However, as practice shows, some people may have an allergic reaction after consuming blackberries – swelling of mucous membranes, nausea, vomiting. To extend the shelf life of blackberries, it is recommended to wash it immediately before use. It is best to keep the berry in the refrigerator, but it retains its beneficial properties and freshness for no more than 7 days, so you should eat it as soon as possible.